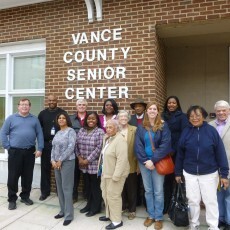 The Vance County Senior Center strives to enhance the quality of life for the aging population of our county. We will promote the physical, intellectual, emotional, social and economic well-being of our seniors through advocacy, recreation, nutrition, information and education. We pledge to enrich as many lives as we can by supporting independence and vitality for the seniors of Vance County. The Staff at the Vance County Senior Center can connect you with services in our area, regionally or nationwide. We are here to help!